This has been an exciting year for American Made woven wraps. I have been watching excitedly as more and more American mills are bursting onto the scene. 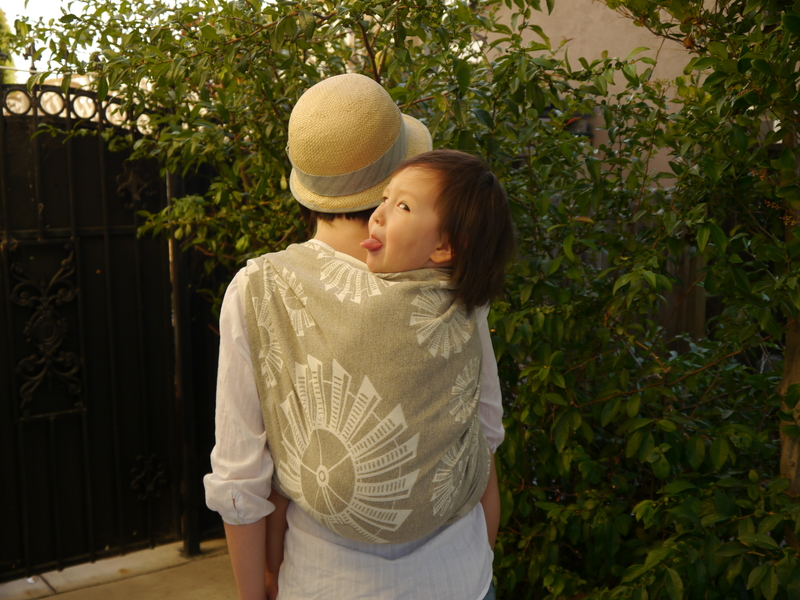 When Bijou Babywearing offered me a Windmills High Plains Woven Wrap to test, I was really excited! Another U.S. company to check out, and they were experimenting with Eco-friendly textiles – something I am always really interested in. The owner Jamie Gassmann, mother of two, is a fellow La Leche Leader. 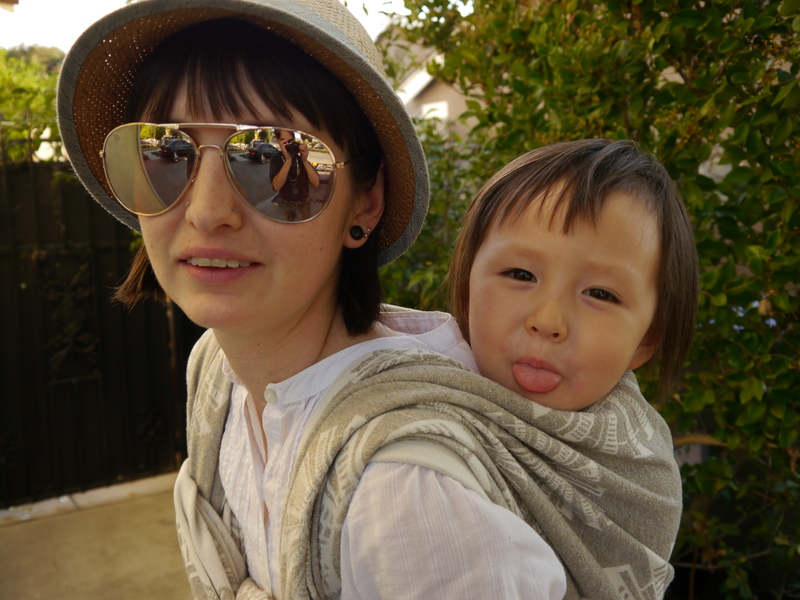 I absolutely love supporting companies that share in my values, and Bijou Babywearing is ticking all the right boxes. 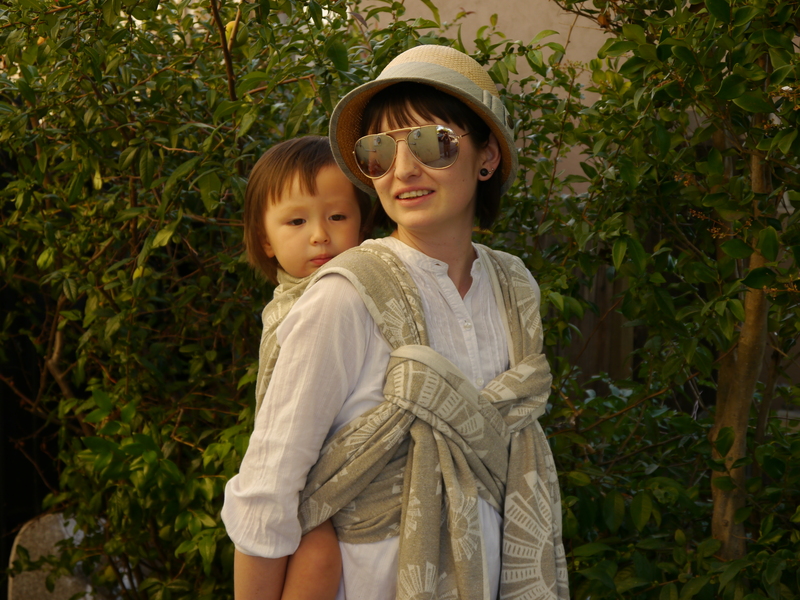 The Windmills wrap is woven with a trademarked cotton fiber called Eco2Cotton. It is considered a recycled yarn, spun from the scraps of fabric taken from the cutting-room floor in large textile factories. It is largely a cotton fiber, though there is some polyester also spun with the cotton as it ends up in the fabric scraps too. The yarn is not re-dyed, which contributes to the eco-friendly element of this woven, and it gives it this very unique neutral greyish tan color. It reminds me of television static, it is mostly grey – but you can see these little pops of color when you look at it from certain angles. The Eco2Cotton is used as the weft, against a natty warp. It is a gorgeous, natural looking woven that can be dressed up or down for any occasion. Unlike some of my other favorite dressy natty wraps, this one can take a beating. The cotton blend can be thrown into the washer, and ran through the dryer on a no-heat setting. No matter how many times it ended up balled up my bag somewhere, it never wrinkled or creased. My first impression was that this wrap was so heavy! It was really thick in hand. Sure enough, it weighed in at a hefty 325 g/m2. This is comparable to the Pavo Etini’s, and reminded me in hand of the thicker 70/30 Natibaby Linen blends, like the Linden. Thick, grippy, textured, but with a smooth quality to the fabric that made it feel really rich. I was not surprised to find that it shared some of the same wrapping qualities as those thicker Natibaby blends too. The Windmill design is beautiful! It is modern, yet still recognizable. It is a very tasteful design, whimsical without being cartoony. This wrap had a lot of grip. It took some work to get it tight enough, but it stayed where you put it, even with a lot of jumping around from the toddler. Because the fabric was not particularly bouncy, it was missing some of that “ace bandage” moldability, and with a thicker wrap – that means you have to be meticulous with your wrap job. A sloppy wrap job grew uncomfortable after a short time. When I took the time to really tighten strand by strand and not leave any slack in the carry – it was rock solid even 45 minutes later with a sleeping 3 year old. I found it very supportive in both a ruck, and a double hammock. I tried it with a ring finish too, and its grip made it a very good candidate for a knotless finish. No movement whatsoever. 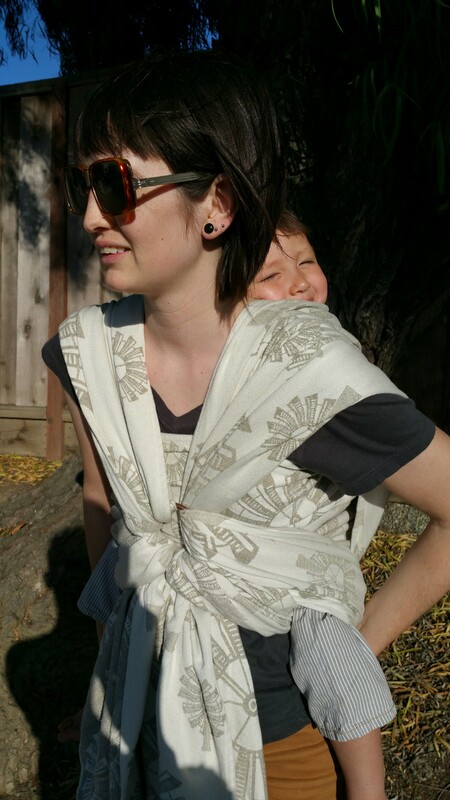 It has been pretty hot here in California, and the thick wrap was insulating in multi-pass carries. I think this wrap is going to become more and more popular in the fall and winter months when that blankety softness that is one of its most prominent features will be coveted. I am already picturing how beautiful the natty is going to be photographed against the snow. Because of the thickness of this wrap, it is not going to be one of my top recommendations for a first time wrapper. The texture, the grip, and the innovative use of recycled fibers makes this wrap a welcome addition to any experienced wrappers toddler stash. The price is $165 for a Size 6, so it is in the mid-range category. Bijou proudly donates portions of their profits to The Carrying On Project – as if you needed another reason to want to check this brand out. I am so happy to have had a chance to try their first Eco2Cotton blend release, and look forward to watching this company grow. Previous So You Want to Buy A Woven?